Lumiere 2016 kicked off with a bang last December, bringing a series of new artistic lighting installations to the West End. An annual event inspired by light and artistic expression, Lumiere is driven by the desire to build community during the rainy season in the West End. 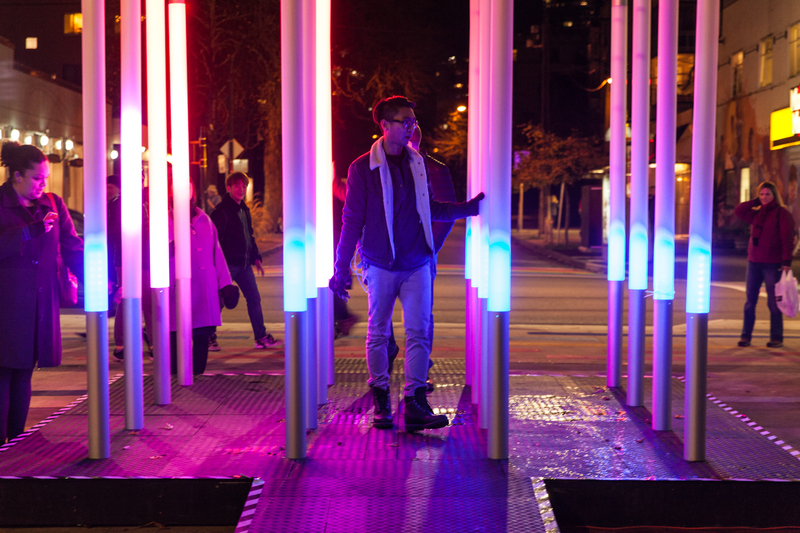 On December 3rd, a series of lighting installations were unveiled in Morton Park and Jim Deva Plaza paired with live music, performances and public engagement initiatives. Here’s a recap of some of the fantastic artistic lighting contributions we had on display at this year’s event. Returning for the second year, Luna was created by world renowned decorative lighting experts MK Illumination. 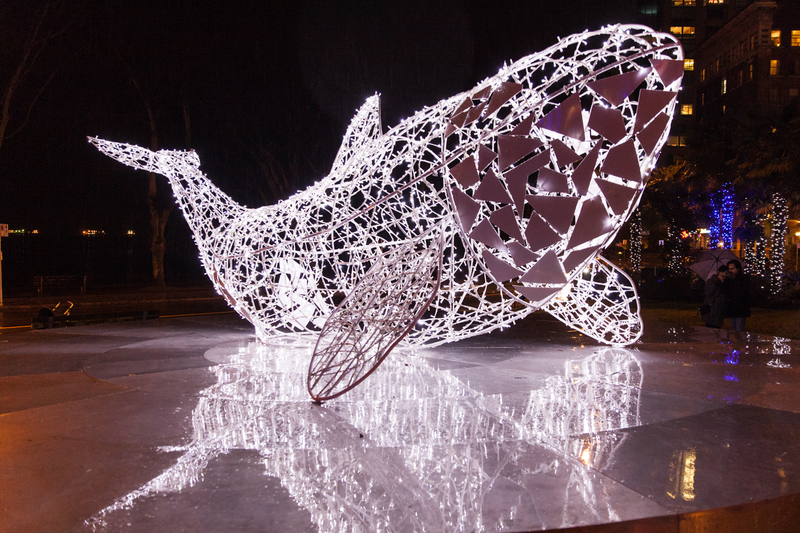 A bespoke one-off design, Luna was made specifically for Lumiere in recognition to the whales in the waters around Vancouver. Luna is named after the well-known orphaned orca whale that inhabited the waters of the Nootka Sound from 2001 to 2006. Separated from his mother at a young age, he spent five years delighting tourists and residents alike off the coast of Vancouver Island. The white powder-coated frame is 7 metres long by 2.5 metres high and contains over 6,000 LED white environmentally friendly bulbs. Toronto-based artist Erdem Taşdelen’s Postures in Protest has been adapted for Jim Deva Plaza in the form of six double-sided light box signs. Curated by Burrard Arts Foundation, the artwork comprises an assemblage of adverbs that describe the ways in which individuals stage protests in popular uprisings. These adverbs, as modifiers of verbs, indicate how specific actions transpire, pointing to the strength and fortitude of those involved in protest. Installed in a public site in the Davie Village dedicated to the late Jim Deva, the piece honours the activist’s advocacy for LGBTQ2+ rights and his battle against censorship. It is also intended to encourage a sense of pride in those who are fighting against the social inequalities that still persist today. 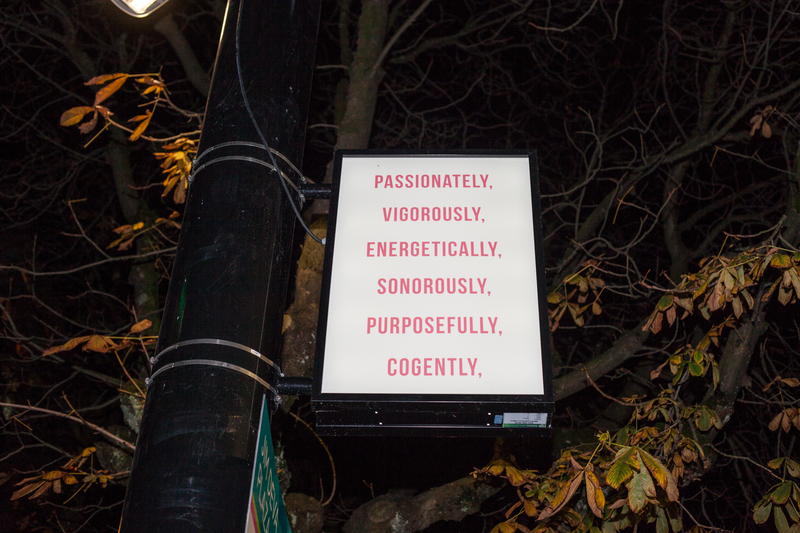 Hfour Studios installed a temporary art installation called “The Limitation Of Words To Describe Feelings” in Jim Deva Plaza, curated by Jamie Hughes. This large community vision board is a space to share thoughts, memories and feelings. When it comes time to write about deep feelings, many of us are at a loss for words. The inexpressible remains just beyond our literary grasp. But we persevere, and try our best to communicate concepts deeper than language, in whatever way we can. An extension of the Jim Deva Plaza megaphone, and a response to Postures in Protest, this community vision board is a canvas to express yourself through the written word. Lighting up our thoughts through public art, the ideas transcend from physical to digital as they are shared online. The notion of the Jim Deva Plaza expands as social media has become the new public megaphone. No community vision board would be complete without a call to action. There’s a very important question associated this work that relates closely to the life and legacy of Jim Deva. Jim Deva was a trail blazer, a pioneer, a man that stood up for what he believed. He was a fearless leader who followed through with his vision and challenged the status quo. Fighting for freedom of speech, expression and equality Jim fearlessly battled the justice system and won a case that would change censorship laws and shape Vancouver’s LGBTQ2+ community forever. From December 3 to December 6, “The Limitation Of Words To Describe Feelings” was open for contributions. Check the hashtag #LimitationOfWords on Twitter and Instagram to see what we heard. 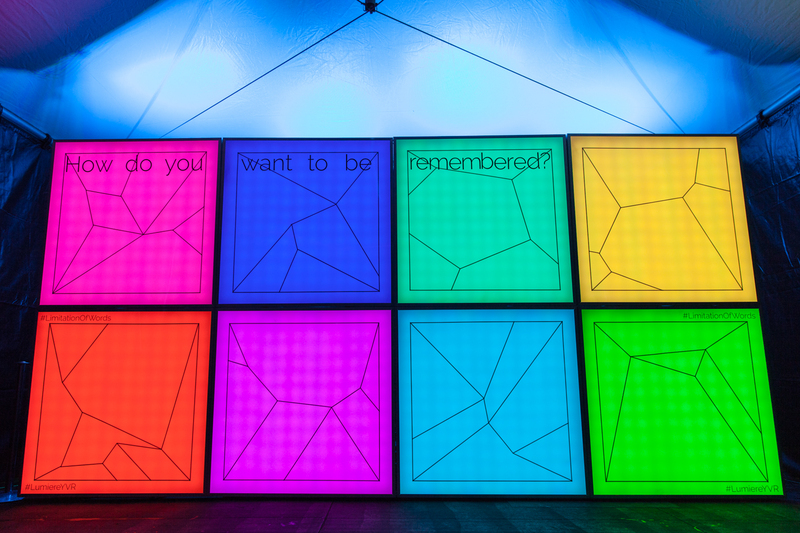 Tangible Interaction’s SHINE WITH PRIDE celebrates the West End’s LGBTQ2+ heritage with a participatory light installation that reflects people’s interactions through stunning animated patterns of light and colour. Comprised of an array of 16 acrylic tubes on a platform with hundreds of responsive LED lights inside each tube, SHINE WITH PRIDE is an open artwork that invites the viewer to step inside and experiment hands-on. Created to be a piece for the whole community, the installation is open and accessible for anyone. When no one is interacting, SHINE WITH PRIDE displays a soothing, pre-programmed animation. However, as people weave in and around the array and touch the tubes, the piece reacts by changing colours and displaying energetic patterns. The more people participate, the more elaborate and colourful the light animations will be. Curated by Burrard Arts Foundation, SHINE WITH PRIDE invites anyone passing by to come into the plaza for a closer look, to play around, and to see how the artwork responds to their movements. 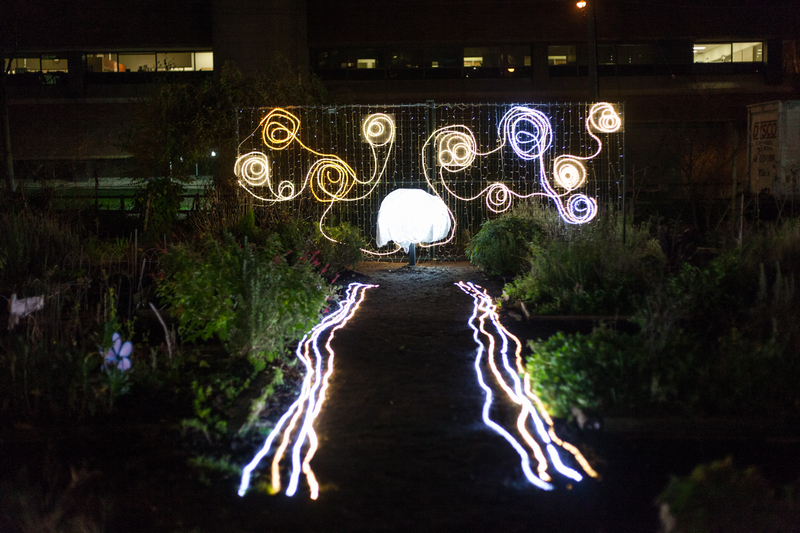 Expanding on last year’s successful Davie Community Garden installation Light Gives Life, this year the Illuminating Engineering Society BC decided to follow along the natural progression of time and turn the sun into the moon. The concept of beauty given off by the moonlight and sunlight will be this year’s overarching design. The main attraction is at the back of the gardens, where the moon is located against the eye-catching LED backdrop. The backdrop features last year’s popular recycled floral LED display. Upon entering the garden, you will be greeted by a canopy of lights that act as the starry night sky. For more on this year’s event, follow Lumiere on Facebook, Twitter and Instagram.